Hollywood and Vine, crossroads of stars and movie makers in a bygone era, will be the site of an $800 million hotel, residential and retail development intended to restore luster to the iconic intersection. 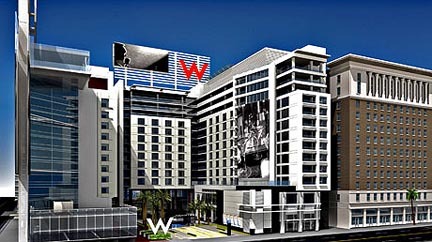 The W Hollywood Hotel & Residences will include a 300 room W Hotel, 143 residences, 374 apartments, approximately 60,000 square feet of retail space, and a 9,200 square foot Bliss® Spa. Residents will have all the benefits of being attached to a W Hotel, including signature amenities enjoyed by hotel guests and exclusive access to a private rooftop pool and fitness center. 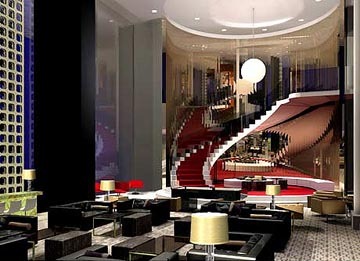 Owners will have access to the hotel's facilities, including 24-hour room service, daily housekeeping and concierge services. 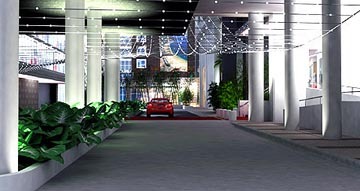 The W Hollywood Residences are being built to the standards of the U.S. Green Building Council's (USGBC) LEED (Leadership in Energy and Environmental Design) program and is expected to open mid-2009.